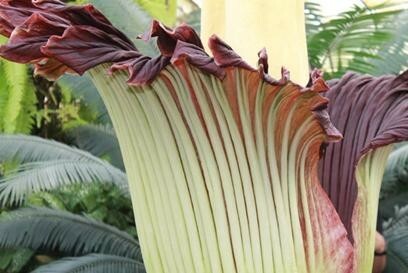 The "Titan Arum" or "Corpse Flower" , as its also known, produces the worlds biggest flower and Melbourne saw Australia's biggest ever bloom at 2.63 metres. While its not the tallest ever grown, this Titan Arum spiked my interest early on, as it shot out of the ground on February 9th, it became the first corpse flower to have its own twitter feed. 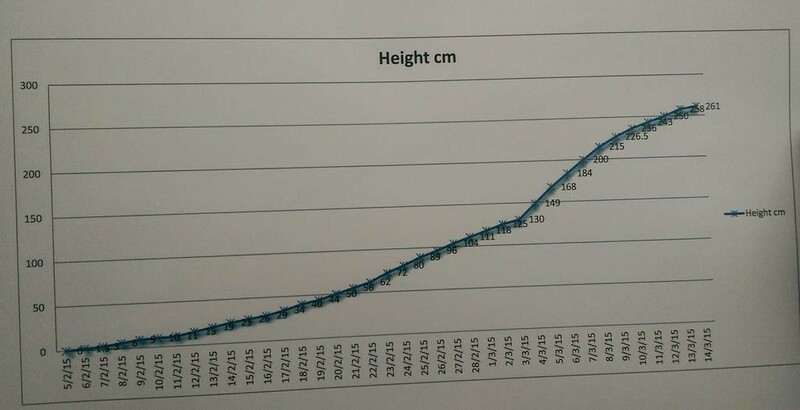 So while it grew 10-20 centimetres a day, so grew its following, and grew its confidence as a personality it seems. Titan Arum took "selfies" and engaged with its fans every day, citing measurements, offering quirky facts about itself and answered tweets humorously as tweets came pouring in asking all sorts of questions. I learnt from the witty Titan Arum that it was both Male and Female and preferred to be called "It"! Lucky for me once the word was on twitter that it was going to bloom for the weekend, i thought it was something i could not go without seeing! I was already in Melbourne for "mad march" seeing a friend who flew in from another state, so could quickly pop in. Wasnt expecting a queue! It was a rather warm day and i was worried about the smell, which was described as being like smelly socks, rotting flesh or a tuna sandwich! I grew up with the smelliest teenage brother so i was hoping i could handle it, and that in fact, i thought that this may have been what my nostrils had been training for all these years! The little girl in front of me in the queue looked up at her dad and said "Its not going to smell too much, is it dad? ", at least i wasn't the only one worried. As the queue grew, limited numbers were allowed in, 2 out and 2 go in etc. As i walked in a RGB volunteer came in the door with us, very excited and knowledgeable and gave me the run down on what had been happening. He introduced me to the previous Titan Arum that had grown and would hopefully bloom again in 2 years, it was brown, but he assured me there was a big tuber growing underneath. (see pictured). Then we met "it", in all its glory. The smell was only slight, it had nothing on my little brothers smelly socks, just a faint "off" smell, a bit like when a bouquet of flowers turn. So it was still a "floral" smell of sorts, even if it was a bad one. My son didn't even cover his nose, and he does that when we walk past any strong smelling nice flowers! While not the most beautiful flower you will ever see, its skirt was lush and luxuriously velvety red. It was tall indeed, which gave it more glamour. And with its smell, it had presence. 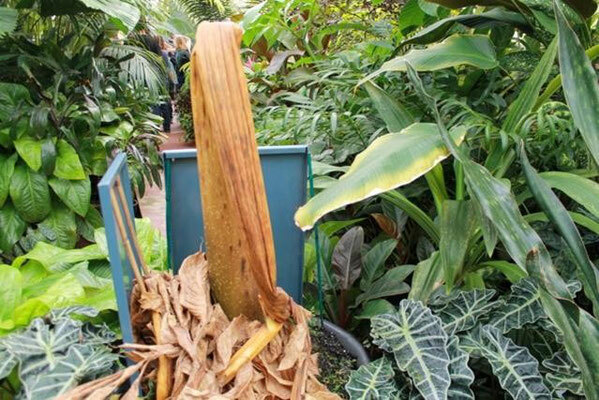 Its bloom was fleeting, just 3 days from start to finish, but it attracted 20,000 visitors to the greenhouse, and donations were made so that next time Titan Arum blooms it may be in its own brand new greenhouse, all to its own. After all, every star should have its own dressing room! See @RBGTitanArum on Twitter and be entertained.